In the section Where is Calry? it was shown that Calry is a parish within the barony of Carbury in the county of Sligo. More detail on this political and administrative landscape of Calry will now be explained using maps. Throughout world history, the production of accurate maps was fundamental, not only for navigation, but for the control and administration of territories and peoples. Maps were also important for infrastructural planning, and still are today. Between 1829 and 1842 the Ordnance Survey Ireland (OSI) completed the first ever large-scale survey of an entire country. The OS sheets published were at a scale of six inches to one mile. Acclaimed for their accuracy, these maps are regarded by cartographers as amongst the finest ever produced. Having an accurate map with the country or territory broken down into smaller, manageable units was fundamental to conducting a comprehensive survey of lands and the population. The driving force behind most surveys carried out by administrative authorities is the assessment of taxes to be paid to the government, local authorities, or religious organisations. Authorities had to assess who owned what, and then impose an appropriate tax rate. 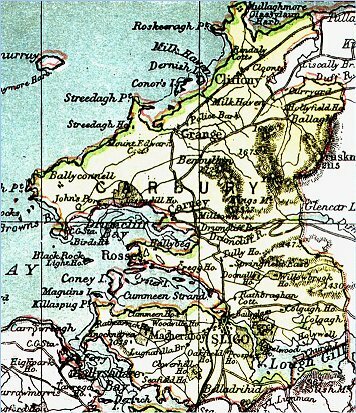 Griffiths Valuation of 1857, which became the basis for rateable valuation, was dependent on having deailed OS maps available for the whole of Ireland. In Ireland, counties are divided into baronies, which are equivalent to the hundreds in England and seem to have formed out of the territories of the Irish chiefs, as each submitted to English rule. County Sligo has six baronies: Carbury, Leyny, Coolavin, Corran, Tirerrill and Tireragh. CARBURY takes its name from Cairbre, third son of Niall of the Nine Hostages. This Niall had eight sons, Loegaire, Conal, Crimthan, Fiach, Manius, Conal Gulban, Owen, Cairbre and Ennius; and as the first four remained in the southern parts of Ireland, their descendents were called the Southern Hy-Nialls; while the descendents of the last four, who took possession of the north, got the name of the Northern Hy-Nialls. The barony of Carbury is comprised of seven parishes: Ahamlish, Rossinver, Drumcliff, Calry, St John’s, Kilmacowen and Killaspugbrone. A parish is divided into smaller units called townlands. A townland (Irish: baile fearainn) is a small geographical division of land used in Ireland. The townland system is of Gaelic origin, pre-dating the Norman invasion of 1170 and most have names of Irish Gaelic origin. However, some townland names and boundaries come from Norman manors, plantation divisions, or later creations of the Ordnance Survey (Wikipedia). 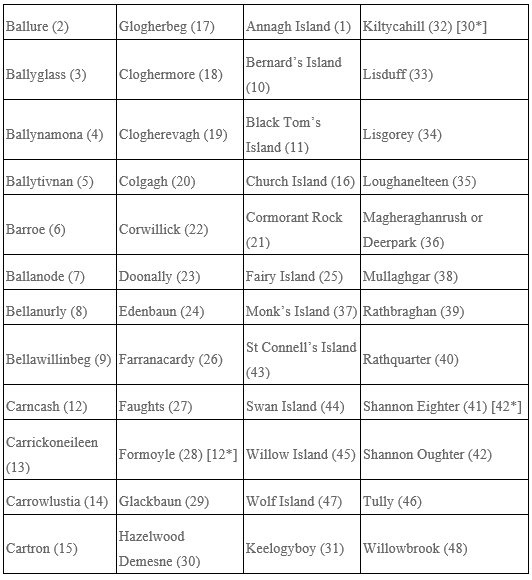 The OS sheet published for Calry shows 48 townlands. Several small townlands are islands in Lough Gill. In family history research, it is very important to know the name of a townland in which an ancestor was born. The complete list of the townlands of Calry is tabulated below. The numbers in parentheses refer to the numbered townlands on the map. Note that three townlands [ * ] are mislabeled on the map and the intended number is shown in the table. To view the index of townlands for Calry, click here: The Irish Townlands Database is an excellent online resource to identify the townlands within the parish of Calry. It is a voluntary project of the Irish OpenStreetMap community who are currently actively tracing all townland boundaries from GSGS 3906 map sheets into the OpenStreetMap database. 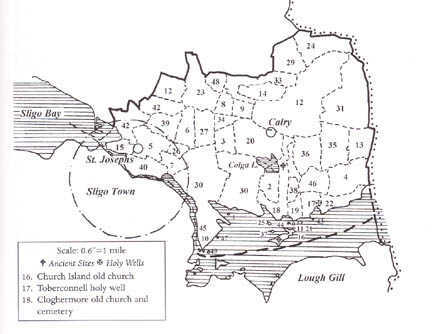 On this site there are only 36 townlands listed for the parish of Calry representing 84.5% of all the area in Calry.